Mix marinade ingredients and stir well. 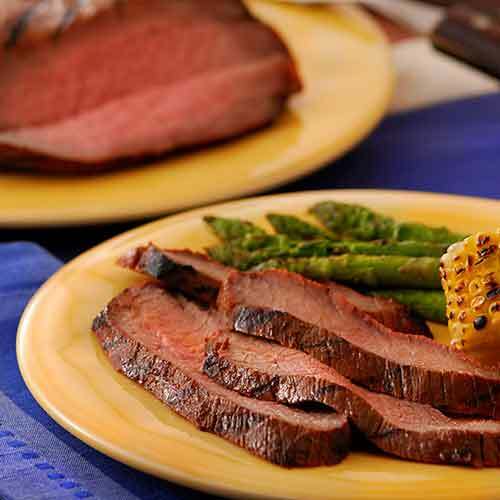 Marinate the tri-tip in the refrigerator for 4–12 hours. Grind beef bouillon cubes into a powder. Remove tri-tip from marinade. Sprinkle an even coat of bouillon powder over entire tri-tip. Build a charcoal fire on one side of grill, such that the coals are situated on only one side of the grill, leaving the other side void. This will create an area for lower temperature indirect cooking away from the coals. Grill tri-tip directly over coals (approximately 500˚F) for 4–5 minutes on each side. Transfer tri-tip away from the coals and cook with indirect heat (approximately 300˚F) for an additional 30 minutes. Internal temperature of tri-tip should reach 140–145˚F for medium rare–medium. Remove tri-tip from grill and wrap in foil. Let beef rest for 15 minutes before removing from the foil and slicing.